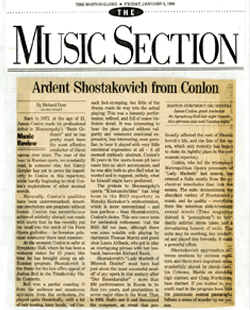 The BSO's first performance of music from Lady Macbeth of Mtsensk was presented in the form of an extended orchestral concert suite arranged and conducted by James Conlon, who led two performances in Boston and one performance in Hartford, January 4-6, 1996. 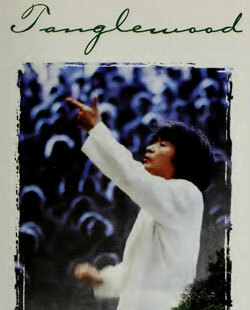 The extended orchestral suite arranged and performed by Conlon consisted of the following scenes: "In the Ismailov's Yard", "Dangerous Tension", "Katerina and Sergei I", "Passacaglia", "Katerina and Sergei II", "The Drunkard", "Police Pressure", and "In Exile." 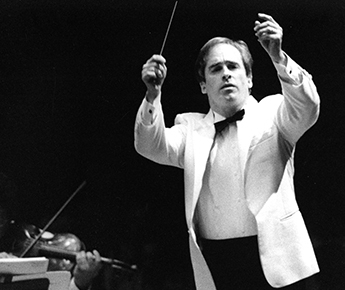 In July 1998 James Conlon again led the BSO in a performance of music from Lady Macbeth of Mtsensk at Tanglewood -- this time in a shortened version of the 1996 suite that included the following scenes: "Dangerous Tension," "Passacaglia", and "The Drunkard." CLICK HERE to view the BSO's performance history of Shostakovich's Lady Macbeth in HENRY, the BSO's Performance History Database!